In the era of globalization, moving to another country has never been more possible. Given it is not the unfortunate circumstances of climate change or armed conflict, people choose to go on the road and move families and relocate to a new city or country; this happens more often than ever before in history. People, naturally, want to experience another culture, to see new cities and try new foods. These are usually some of the experiences we look after when we select the next destination for a holiday, a choice that is sometimes quite hard to be decided, as there are so many beautiful countries all around the world. It is also good to stay informed and well-acquainted about the place where you are determined to go next. Iceland is sure not to disappoint you with what it has to offer. Even if you are looking for something more than a respite, perhaps to forge a career in Iceland, below are several useful information and instructions you can go through, to get more familiar, to direct you in the process of settling. Gathering enough information about Iceland is basically saying ‘see what you’re getting yourself into.’ If you are from a warmer country, perhaps the temperature might be an issue for you (at least until you get used to it, if you get used to it). The average summer temperatures–at least on the southern part of the island where Reykjavik, the capital of Iceland also sits– average around 10–13 °C (50–55 °F). The last time the temperature hit more than 30°C (86°F) was in the Eastern fjords back in 1939. Of course, it is not only that you need to harvest information on the weather and the fact you need to carefully choose what you bring in your luggage (warmer clothes and raincoat), you should also get acquainted with all other aspects. What processes should foreigners pursue if they are to reside for an extended period in Iceland? If you are applying for a residence permit, what is the difference if you are a European Union/European Economic Area (EU/EEA) citizen or not? Obtaining permission for work and residency in Iceland requires to undergo a certain process, and this can run more smoothly for people who come from countries that are part of the EU/EEA. If you are a European, you will have an easier time regulating your immigration status and move to Iceland. 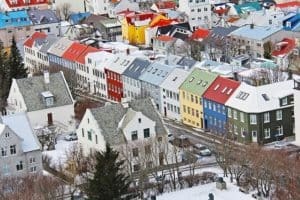 EU/EEA citizens can reside in Iceland without having to obtain residency for three months, a regulation that is usually active elsewhere in the European Union, too. However, if you wish to stay in Iceland for longer than that, you will have to register your status, and in getting residency, one must prove while applying they can earn enough income on a monthly basis. The sum of money an individual is expected to earn is about ISK 164,000 (the currency is Icelandic Krona) or what would roughly be EUR 1300/USD 1600 per month. For citizens outside the EU/EEA, the procedure to obtain residency in Iceland may be a bit more complicated. Whether you receive the Schengen visa, you can solely visit the country. However, the visa is not the sole requirement if you are also looking to also work in Iceland. Two ways through which you can pave the way for a residence is falling in love and eventually marry someone who is an Icelandic by nationality. Besides becoming a spouse, an alternative is that you become a student in Iceland. The third and agreeably the hardest option is to get a work permit, which may take a real pull as it is Icelanders and EU citizens who have the advantage. Regardless, it is possible for specialized positions or with companies open to submitting the necessary documents that one could attain a work permit and receive residency. Although it might sound like a mythology and folklore book such as the Finnish Kalevala, Kennitala is de facto another important thing you need to settle as soon as you move to Iceland — this is the identification number for residents. Once you have made it past the immigration office, you are all ready and set to obtain your number. If you don’t have a Kennitala, you are virtually handicapped. That is the number you need to access almost anything – from going to the doctor, to opening a bank account in Iceland or becoming an owner of a house/apartment. Please also note that non-EU/EEA residents cannot apply themselves to receive this identity number. If you plan to work in Iceland, the Kennitala is requested by your employer or bank you are visiting. The best place for newcomers to Iceland is undoubtedly Reykjavik, which is the capital city of Iceland. It is the city where everything happens, where there is an array of jobs and a plethora of residential opportunities, but this city also comes with quite some competition. As Iceland built itself a name as a truly international hub in the past years, its capital city happens to be the most sought-after place to live. However, with the small population, Iceland has an employment rate of 99%, so the odds are that you will strike a contract sooner than later. Outside Reykjavik, Iceland may be a different story, and not the least compelling to see, visit, experience and even live. Iceland is a country packed with what currently a majority of countries lack in abundance – the fresh and enthralling existence of nature. If you are into cozy little huts that you see in the movies, Iceland is the place to go. The nature around Iceland is splendidly preserved, and it is nothing but a testimony of how its people care about the environment. That is one of the plentiful reasons why you should at least visit Iceland at some point in your life.